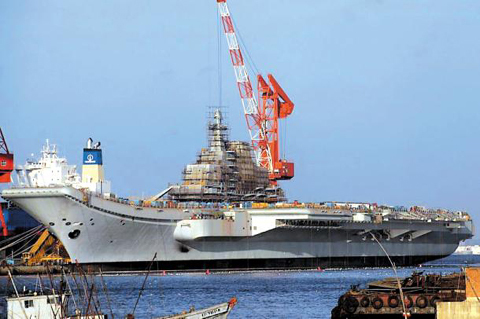 China is planning to build an aircraft carrier according to documents seen by the Asahi Shimbun. The Japanese daily on Thursday quoted the Institute for Ocean Development Strategy, a think tank under China's State Oceanic Administration, as saying in a recent report that Beijing "conceived the idea and worked out a plan in 2009 to build an aircraft carrier." This shows that China "is determined to become a maritime power," the report said. "The task is essential in achieving the great revival of the Chinese nation." The plan has been an open secret, but there has been no official confirmation so far. Chinese Defense Minister Liang Guanglie in March last year said China is the only one among the world's big powers that does not have an aircraft carrier, adding this state of affairs "cannot continue forever." China is believed to be building two 50,000-60,000-ton aircraft carriers at Changxingdao Shipyard, the world's biggest, in Shanghai and is expected to launch one in 2014. The Varyag, an aircraft carrier from the former Soviet Union, is being remodeled at China's Dalian Port. It is also reportedly working on remodeling the 58,500-ton Varyag, an aircraft carrier the former Soviet Union had stopped building, at Dalian Port to launch it in 2012. The country is expected to get a nuclear-powered aircraft carrier by 2020. The Japanese government's new defense white paper to be published on Friday will reflect worries about China's buildup of maritime power.